Fragrant breeze from flowers is enchanting. Many sages on the bank of Yamuna are at his service. Many birds and coels are cooing melodiously in bowers. His curly locks are like a cluster of water bearing clouds. He is adorned with Tulasi garlands. 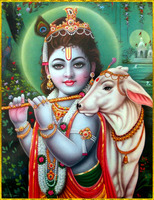 The lotus borne Brahma worships Sri Krishna, the repository of virtues. He delights the hearts of Supreme Yogis. He enthralls the world singing on flute.